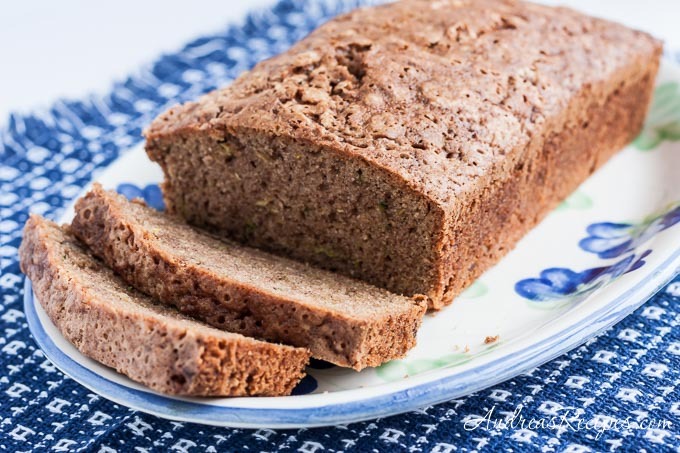 I always loved the smell of this zucchini bread baking when I was a girl. I don’t know where my mom got the recipe, but it is a favorite. The bread is moist and flavorful. In the bowl of the stand mixer, beat the eggs till fluffy. Add sugar, vanilla and oil. Blend well. Stir in the shredded zucchini. Sift together the flour, baking powder, salt, baking soda, and cinnamon. Stir little by little into the batter, being careful not to overmix. Fold in the chopped walnuts. Pour batter into two 9×5 ungreased loaf pans. Bake in the preheated oven for 1 hour, but start checking at 50 minutes. A toothpick should come out clean. Place pans on a wire rack and allow to cool about 10 minutes before removing from pan. Cool completely on the wire rack. Wrap in plastic and refrigerate, or put the wrapped bread into freezer bags and store in the freezer. Will keep for up to three months in the freezer. Hi I love this recipie. I have one almost the same. I do have a question for you. I have made about 4 loaves now of the zucchinie bread and they came out hard like a brick and very crusty on the top. Mary, it sounds like your loaves did not rise, which could be due to old baking powder or baking soda. You might want to test to be sure they are still good. To test baking powder, mix 1 teaspoon with 1/2 cup hot water. The mixture should bubble immediately. To test baking soda, mix 1/4 teaspoon with 2 teaspoons of vinegar. Again, the mixture should bubble immediately.